An alternative to requesting a FET as a replacement from Adafruit if you have a transistor for Q3, is that you can use parts from Radio Shack as Russel 27 explained how to do. If you have a store nearby you can get a resistor to modify the existing transistor with or just get a new transistor and the resistor to make the mod. PhilD13 wrote: An alternative to requesting a FET as a replacement from Adafruit if you have a transistor for Q3, is that you can use parts from Radio Shack as Russel 27 explained how to do. If you have a store nearby you can get a resistor to modify the existing transistor with or just get a new transistor and the resistor to make the mod. Ah! Thanks guys! I have a Radio Shack down the street so I can get the parts very easily. I appreciate the heads-up. Just finished my Ice Clock kit this afternoon. Great build and directions. I especially like that there were multimeter checks along the way, and very detailed and clear photos. I'd recommend this kit to anyone... It's one of the nicest clocks I've seen. I'm posting a picture of the old and the new. The old is the Heathkit GC-1092A clock that I built when I was home from college in the summer of 1977. This clock has run continuously since I built it, aside from the occasional move or power failure, of course. Just as a point of comparison, I dug out the assembly instructions and counted up some of the parts that went into the clock: 102 resistors, 15 capacitors, 31 diodes, and 34 transistors. And that's not counting all the other bits of hardware like a transformer, speaker, displays, switches, and so forth. As I recall, it took me several weeks to put it together. The assembly manual ran 60 pages, including schematics, diagrams, and theory. It had a couple of the features of the Ice Tube clock - battery backup and a photocell to adjust brightness based on the ambient light. I've added John Archie's updated firmware to my Ice Tube clock, which automatically adjusts the timekeeping as you reset the time. The Heathkit clock had an adjustment where you tweaked it until it matched the 60-cycle AC cycle, allowing for very accurate timekeeping. The Ice Tube clock was a fun kit to build. I remember opening the box and thinking "Okay, now where are the rest of the parts?!" I'm working on making a base for the clock to keep it from sliding around. It's a light clock - nothing like the heft of the Heathkit! The base is sort of a work-in-process. What you see is a piece of scrap wood with four notches cut out for the four corners to sit down in and a piece of non-slip rubber material on the bottom. I'm looking forward to using it - hopefully, I'll get 37 years use out of it as well! This is my Monochron Clock. I received it for Xmas. Thanks Adafruit for a fantastic design and super fun project! My clock was a pretty standard build though I chose to solder the FTDI header into my board for a more reliable connection when programming. The secret to doing this is assembling the case from the back to the front rather than front to back. It wasn't hard and it allowed me leave the header permanently attached. I took the code to Mariochron (credits and big thanks go to techninja (James T) & Super-Awesome Sylvia) and I modified it to come up with my own "Marvinchron". Since Marvin Martian is one of my favorite cartoon characters, I dedicated this version to him. The screen shows Marvin marching back and forth at the bottom of the screen (thanks Mario) and on the minute, he zaps the small spaceship at the middle of the screen. Of course a new small spaceship flies right back into the scene after Marvin zaps it. He leaves this new spaceship alone until the next minute. On the 5-minute intervals, a much bigger spaceship enters the screen from the right and uses a laser to zap the small ship. It then takes up residence in the middle of the screen where the smaller ship was originally. Marvin studies it for a moment and then... yes, you guessed it.... Zap! Marvin takes out the big ship! Anyway, I hope you enjoy these photos of the "Marvinchron". My kids motivated me to do this because they like Marvin too (and especially appreciate how much I like him!). Just finished! Great kit! And solving the little problem I had with Q3 actually added to the fun. How boring if it had just turned on and worked the first time. Here is the Ice Tube Clock next to the Verbose Clock. Building the Ice Tube clock I had two problems. First, the regulator was faulty and I had to replace it with one I had. It passed the initial test but had no voltage at the beep test. I had to lift a pin of the output diode to figure this out. Second, my tube came with twisted up wires, and I had to untangle them very slowly and carefully over a couple of sessions. I have no idea how the Russians did any mass production with those evil little wires. It now works fine. The Verbose Clock is a custom build which I'd like to get a kit made up for. It has 24 characters of 14-segment LEDs and displays the time in words. It can also receive and display text over the serial port of the AVR. I didn't see many analog meter clock photos so i thought I'd share a couple that I made. Built this one in an old inoperative Simpson housing. Custom steel and IPE wood housing. Very cool steel/ipe clock case. My heart skipped a beat when I saw the pic of the clock in the Simpson VOM case until I saw it was inoperative. A nice way to use it. 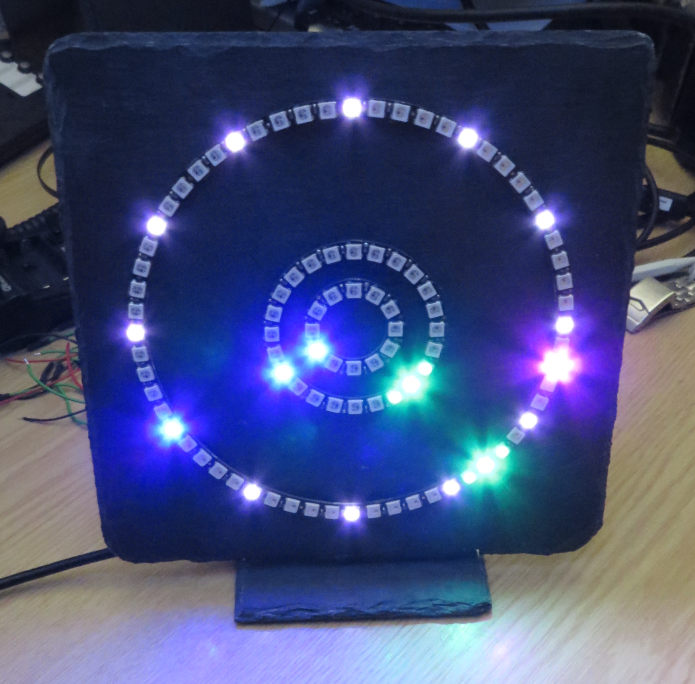 Picture of my 60+24+12 NeoPixel Ring Clock. Done for a college project, it's my multi-purpose clock! Using NeoPixels and the Adafruit NeoPixel library. The initial clock position code was found on the Learning system (I had no clue the useful function "map()" existed, awesome!). "Steam Punk" style clock using a modified version of the "Trinket Meter Clock". Added the softservo library, and wired up a servo on pin 3 to move the pendulum. Added yellow LED's for a more aged look on the meters.